Oh Mike Tyson, you made Nintendo never pair with a sports star again. Punch-Out certainly falls into the category of “different time, different place” kind of racism. You know the kind, the type of racism your grandmother may have where she isn’t really all that racist, but still uses Oriental or colored as acceptable terms. Old fashion perhaps. Now you may be asking, what could possibly be racist about a boxing game? The characters. That’s what. Good ol’ Soda probably doesn’t look all that racist, other than his grotesque appearance, but it’s his history that is a little more shaky. Originally named “Vodka Drunksinski” the character was undoubtedly a portrayal of a drunk Russian. Now that’s not to say that all Russian stereotypes are drunk…but many are. Of course Nintendo of America changed the name from Vodka to Soda after they realized they couldn’t have alcoholic references in their video game. Then there’s Piston Honda, from Japan. There aren’t any downright stereotypes in his appearance, but the character says some pretty strange things. In one of his in game quotes is” Sushi, Kamikaze, Fujiyama, Nipponich..”. Whaaaa? Those are just things that are Japanese, and one of them is Kamikaze?! This one confuses me. Nintendo is a Japanese company, and yet they represent their country with this character? Kamikazes? Really…? The last one that I’ll highlight is Mr.Sandman, one of last bosses of the game. Mr.Sandman comes to us from Philadelphia, and while he isn’t relying on a country stereotype, he’s definitely relying on a racial stereotype. With in game quotes like “Welcome to dreamland Baby!” and “Hey Mac Baby!”, the developers of the game obviously thought all African Americans talked jive. Take one good look at that character design…Yeah, that says enough. There are some also pretty bad stereotypes in the game, like the Indian boxer having a tiger with him at all time, and the Spanish boxer being obsessed with his appearance, but the above three are arguably the worst. Of course Nintendo fixed a lot of their mistakes with subsequent sequels, including dropping Mike Tyson from the game. 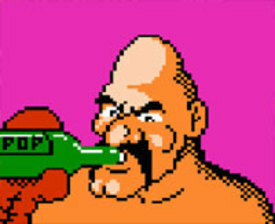 That said, Mike Tyson’s Punch-Out will remain a pretty fun game..but maybe a slightly racist one. Please let me know if you thought this was a worthwhile article, or if you can think of any other racist games you might want to see featured. This entry was posted in gaming, Uncategorized, video games and tagged Gaming, Nintendo, punch-out, racism, Video Games. Bookmark the permalink. 4 Responses to Racist Games: Punch-Out! I like that outlook on the game! The game certainly doesn’t have anything hurtful or offensive in it, it just kind of a testament to early gaming. Thanks for the input! Racist? Maybe but at least it wasn’t done in a malicious manner but in a playful. lighthearted one. It’s a product of an earlier time that features some silly stereotypes. Certainly not malicious or harmful.